New Winter 2018: This gorgeously designed royal Bengal tiger will be the talk of the tree with its handsome good looks and accurate details. The Bengal tiger Christmas ornament is a big hit with anyone who appreciates quality resin animal ornaments featuring lifelike design. It is one of many large cat ornaments from Russell Rhodes, so putting together a collection of lions, tigers and similar beasts is easy, fun and rewarding. 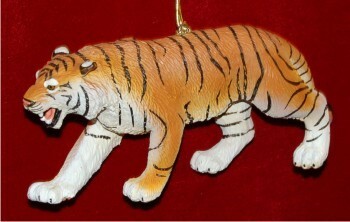 This replica tiger ornament has its own display cord and can be placed anywhere it will bring the most delight. Share some big-cat love with animal enthusiasts on your list with the Bengal tiger ornament in excellent detail. Due to the surface nature of this ornament, we're unable to offer additional custom personalization.